Casey Greinermiller never set out to be in the asphalt industry. It wasn’t until he took a summer job at RS Asphalt Maintenance, Elizabethtown, Pennsylvania, between school years studying fine arts at Kutztown University that he began to consider it as a career option. Art and asphalt may seem two completely different industries, but that’s not how Greinermiller sees it. Greinermiller is now the president of RS Asphalt Maintenance. He purchased the business in January 2015, but the deal has been on his mind since graduating from college almost a decade ago. “I saw what might be an opportunity down the road,” he said. He knew former owner Robert Stanley was looking to sell the business. RS Asphalt Maintenance began in 1977 as Robert Stanley Asphalt Maintenance Inc. When Stanley sold the residential part of the business, he continued to offer commercial asphalt services as RS Asphalt Maintenance. The full-service asphalt maintenance contracting company will keep its name under new ownership, Greinermiller said. In fact, Greinermiller plans to keep most aspects of the business the same, but wouldn’t be opposed to growth. RS Asphalt Maintenance has five seasonal employees, as well Greinermiller and office manager, Gail Frey, who work year-round. Frey has been with the company since the early 1990s. RS Asphalt Maintenance has a tradition of employee longevity. Not only did Greinermiller work for the company for a decade prior to purchasing it, but he said all of his employees are typically returning employees from the previous season. RS Asphalt Maintenance offers linestriping, residential and commercial sealing, crack repair, patching and infrared seamless patching. Although its most popular service is residential and commercial sealing, Greinermiller said the company’s efforts are fairly well split among its services. Greinermiller said his favorite projects are ones that require the full extent of RS Asphalt Maintenance’s services, from patching and crack repair to sealing and line striping. 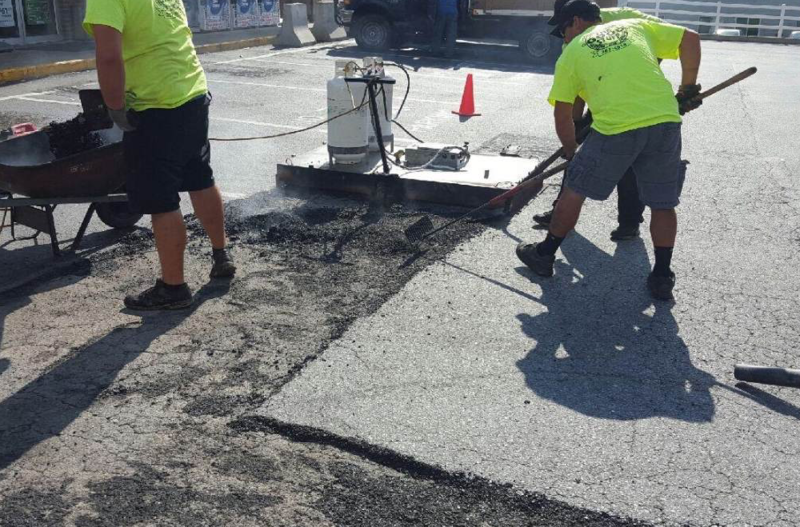 The RS Asphalt Maintenance team uses the infrared heater to remove old asphalt and replace with a fresh mix. Located in Pennsylvania, RS Asphalt Maintenance is very seasonal, from April to November. RS Asphalt Maintenance’s 6-foot by 4-foot propane-powered heater heats the asphalt and allows the crew to re-rake the area and add more asphalt as needed. Greinermiller also hopes to expand to offering asphalt stamping, using their infrared patching heater. He also would like to begin offering thermoplastic in addition to striping. Other than expanding those services, Greinermiller said he plans to operate RS Asphalt Maintenance in much the same way Stanley did for more than 35 years. 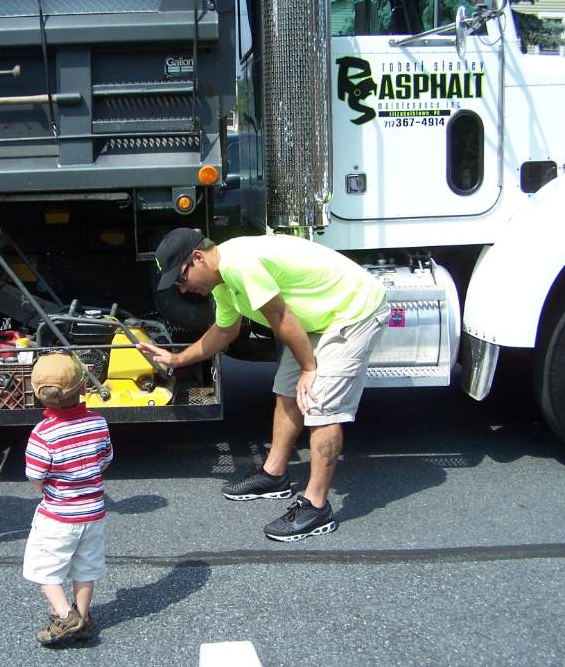 RS Asphalt Maintenance donates its dump truck for the Elizabethtown Public Library’s annual Touch a Truck event, giving children of the community an opportunity for an up-close and personal look at various trucks. Here, Casey explains to a curious youngster how the tamper works. One long-standing company tradition is the use of an oil-based sealer called LN-11 Equinox, rather than a water- or latex-based sealer. Greinermiller said the petroleum-based sealer, which is the same type of oil mixed with asphalt, replenishes what’s been lost to oxidation, soaking into the asphalt rather than staying on top. “The LN-11 Equinox is not an asphalt cement or maltene, it is an asphalt based sealer that is made up of asphalt, mineral spirits and Gilsonite,” Greinermiller said. Gilsonite is a naturally occuring hydrocarbon bitumen also known as asphaltum. “I’ve been told, from our supplier, that we’re one of the largest users of our sealer in central Pennsylvania,” Greinermiller said. Stanley had been using LN-11 Equinox since he got started in the industry. RS Asphalt Maintenance transports the sealer in 200-gallon Marathon skid tanks permanently attached to utility pickups. The tanks are outfitted with petroleum pump seals and powered by Honda engines. Overall, the company has two trucks that it has retrofitted for sealcoating that have been equipped with 5-gallon melters for crack repair, as well as a box van for line striping, a Ford pickup truck for general use and one Peterbilt dump truck for hot patching. 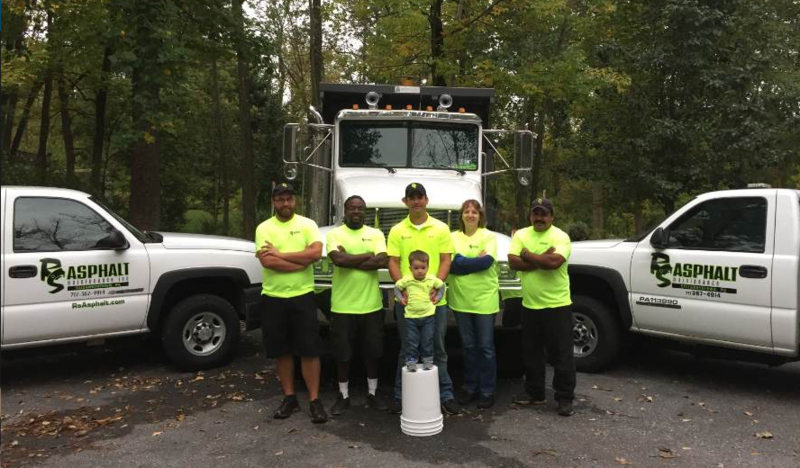 Based in a small town with a population of 11,648, RS Asphalt Maintenance has a legacy of giving back to its community. RS Asphalt Maintenance participates in the Memorial Day parade each year and brings its Peterbilt dump truck to the local library’s annual Touch A Truck event. As it did for Greinermiller, maybe one experience is all it’ll take to inspire a future career.